THANK YOU to our Bismarck Table Sponsors - Basin Electric Power Cooperative, KX12, Starion Financial and Earth-Kind! 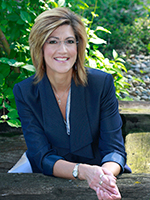 Marci Narum is a professional speaker and coach. 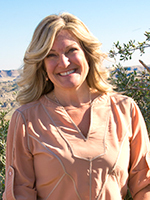 She was independently trained and certified as a member of the John Maxwell Team. Marci provides leadership training for groups and individuals who seek to grow personally and professionally. Marci brings 21-years of experience in TV news as a producer, anchor and reporter to her business. She holds a BA in Broadcasting from Minot State University. She has been honored by the Northwest Broadcast News Association, North Dakota Broadcasters, Bismarck Public Schools, North Dakota Education Association, North Dakota Forest Service, North Dakota Jaycees, and North Dakota Speech and Theater Association. She is a graduate of the Bismarck-Mandan Leadership program and an Accomplished Toastmaster. Marci is also the owner of Leaving Impressions, a creative art business in which she combines the beauty of words with the beauty of nature in framed creations. Every piece is unique. From more than a thousand designs, she creates framed pieces and other gifts featuring positive and inspirational messages, quotes or scripture, adding pressed leaves, heads of wheat, feathers, seashells, sand or tree bark for the one-of-a-kind embellishment. Kari, founder and CEO of Earth-Kind, is an award winning entrepreneur with a focus on growing ideas, products, companies, and people through a sustainable approach. Her company’s mission is to preserve the good and prevent the rest through the development and manufacture of natural, proactive alternatives to protect the spaces in which we live, work and play from pests and odors. A tireless champion for small business and entrepreneurship, Kari is a true mother of invention having created an entirely new product category while raising a family and growing her business. She is best known for the invention and commercialization of FRESH CAB® Botanical Rodent Repellent, the first and only natural repellent product to gain Federal EPA certification for indoor use. FRESH CAB has generated more than $40 million in sales at retail. Earth-Kind is committed to the communities in which we live and work, investing through the employment of developmentally disabled citizens; the utilization of natural, renewable resources and a responsible (2%) carbon footprint. As a result of her achievements, she has been recognized as one of Ernst & Young’s 2012 Entrepreneurial Winning Women, an Inc. 500/5000 fastest growth company, and a runner-up for National Small Business Person of the Year by the U.S. Small Business Administration. Kari was previously named North Dakota’s Small Business Person of the Year. Rosemarie is a life long North Dakotan; born in Minot, raised and educated in Fargo and a state wide leader. She married NDSU classmate, John Myrdal, and raised five children on their farm in Pembina County. Rosemarie taught in Edinburg, then became the school district business manager before serving on the school board. In 1984 she was elected to the ND House of Representatives and served four terms. In 1992 she campaigned with Ed Schafer. They were elected and served two terms as Governor and Lt. Governor. One of her roles as Lt. Governor was to serve as the Governor’s representative for a new project called Centers of Excellence in Rural America. The project promoted the use of information technology in the development of new business in small communities. She also credits Traveling for Capitol for a Day visits as an opportunity for her to learn a great deal about economic development in rural communities. When John passed away in October 2000 and her second term as Lt. Governor was ending, Rosemarie decided to return to her home and local community activities where she has remained very involved. One of her first roles was serving as a board member for First Care Health Center in Park River. This involved working on the planning for building a new clinic and remodeling the hospital with the development of the use of health care information technology. She also renewed her involvement with the Northeast ND Heritage Association and her long time interest in heritage tourism led to Rosemarie’s appointment as an advisor to the National Trust for Historic Preservation and work as a Preservation ND board member for the Prairie Churches project. Justice Maring graduated in 1975 from the University of North Dakota School of Law with a Juris Doctorate Degree. In 1976, she entered the private practice of law and spent 20 years practicing law in ND and MN state and federal courts. During her practice of law, she handled cases in many areas of civil litigation. She is certified as a Civil Trial Specialist by the Minnesota State Bar Association. She is a member of the International Society of Barristers. 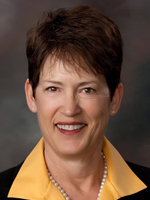 She has served in leadership positions in both the ND and MN Bar Associations, including president of the Clay County Minnesota Bar, president of the East Central Judicial District Bar Association, president of North Dakota Trial Lawyers Association, and a member of the Board of Governors of the State Bar Association of North Dakota. She has served on numerous committees to study and improve the system of justice. 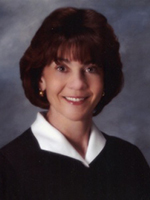 On March 1, 1996, she was appointed by Governor Schafer to the North Dakota Supreme Court to fill the vacancy created by Justice Levine’s retirement. On November 5, 1996, she was elected to complete that term, and, in November 1998 and 2008, she was elected to ten-year terms as a justice on the North Dakota Supreme Court. She retired as a Supreme Court Justice effective December 31, 2013, and was appointed to serve as a surrogate judge. In addition to membership on numerous other committees, she served as chair of the ND Judicial Conference, chair of the Gender Fairness Implementation Committee, chair of the study implementation committees of the Juvenile Drug Courts in North Dakota, chair of the Joint Procedure Committee, chair of the Judicial Education Commission, chair of the Juvenile Drug Court Advisory Committee, and a member of the Juvenile Policy Board. She is currently a member of the Governor’s North Dakota Commission on Drug and Alcohol Abuse, and the Alternatives to Incarceration Interim Legislative Committee. Connie Sprynczynatyk was selected by Secretary of the Army, John McHugh, to represent the state of North Dakota as a Civilian Aide to the Secretary of the Army. 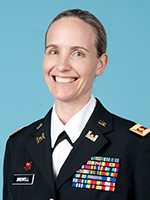 She serves as a vital part of the Army, promoting good relations between the Army and the public and advising the secretary about regional issues. retiring from an extensive carer in public service at the end of 2013. Most recently, Connie served 17 years as the sixth executive director to represent the North Dakota League of Cities, a 101-year-old organization that serves the education and advocacy needs of North Dakota’s 357 incorporated cities. 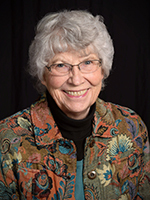 Prior to joining the League of Cities, she served 12 years on the Bismarck Board of Park Commissioners and in 1990 was the first woman elected to the Bismarck City Commission where she served 20 years. In 1999 she was a Council of Local Authorities for International Relations Fellow in Japan and in 2011, a Legislative Exchange Program Fellow in Russia. Connie has also served on the board of directors for the North Dakota Insurance Reserve Fund, on the Upper Great Plains Institute Advisory Committee, and the North Dakota National Guard Family Executive Council. Connie is a graduate of NDSU, and she and her husband, David, reside in Bismarck. Tracy Bridwell is the Mobilization Readiness Officer for the North Dakota Army National Guard. She is a native of Bismarck, North Dakota and is a graduate from the University of Mary with a degree in Organizational Leadership. Tracy has served in the North Dakota National Guard since 1990 and has worked full time for the North Dakota National Guard since 1993. She took her commission as Second Lieutenant in 1999 after serving nine years as an enlisted soldier. She served from 2009-2010 on a NATO Peacekeeping mission in Kosovo and was promoted to the rank of Major during her deployment, in February 2010. She has received numerous awards including Meritorious Service Medal, Army Commendation Medal (3), Army Achievement Medal (2), North Dakota Meritorious Service Medal, North Dakota Commendation Ribbon, and the North Dakota Achievement Ribbon. Tracy is involved with the following pr ofessional membership organizations: Engineer Officer Association, National Guard Officer Association. She is also a member of various equine organizations. Tracy lives in Bismarck with her husband and two children.